I'm going to be honest, trying to think of a name this time round has been the hardest yet, typical as we had a girls name picked out from the start of this pregnancy! But this time we have really struggled with finding the right name, its taken us a long time (well for us anyway) but we finally have a name for this baby boy! Thanks to the Namey app we have been able to research so many names, find out the meanings - which this time round has been a small factor of choosing a name with this being a Rainbow baby and also after the loss of my brother very recently, so I was quite keen to see what the meaning behind the names that we liked were. It was also pretty fun being able to look up what all of our names meant and where they originated from too. You can also explore the top 10 trending boys and girls names as this can also be a factor when choosing a name as well, nobody wants to have more of the same name in their Childs classes at school! I feel so confident that this is the name for our baby boy now and I cant wait to meet him, its been so nice being able to call him a name like he's a real person now, also the children are getting to bond with him and associate the name with my bump which is nice. I honestly thought at one point we wouldn't have a name for bump and he would be born with no name, which is totally fine of course but we have always been prepared with a couple name options before our previous 2 were born. 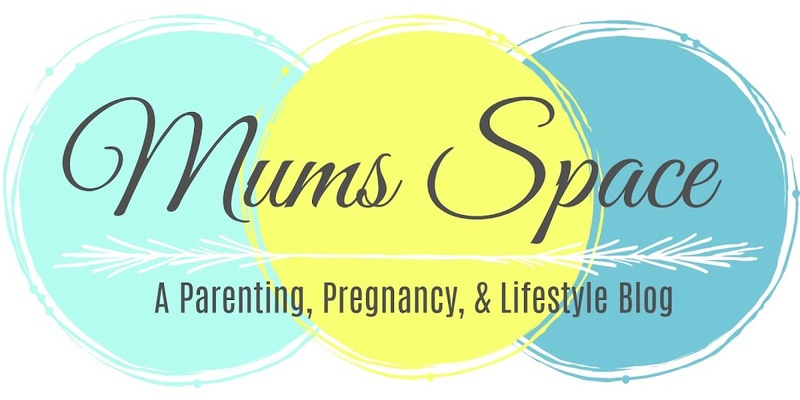 Have you always been prepared with a name or waited until baby was born? The Namey app is available to download via the Google Play Store for Android and the Apple App Store for IOS for free, or a premium version is also available to download at 0.99p and this is the version I have been using. 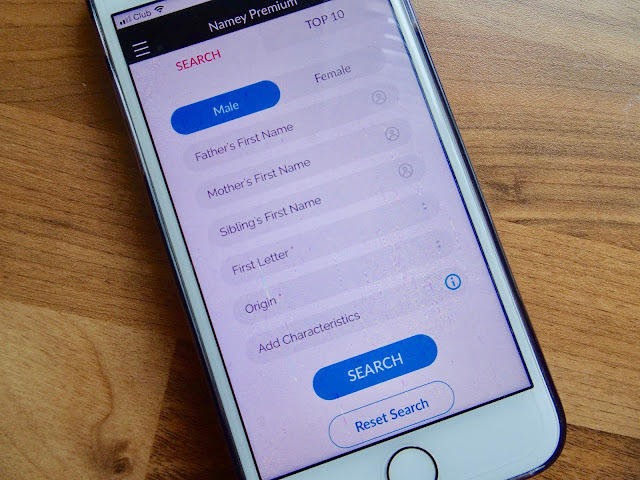 Namey is the only baby naming app available that uses artificial intelligence and algorithmic matching to suggest names that are highly relevant to the user, making it a unique experience for everyone! 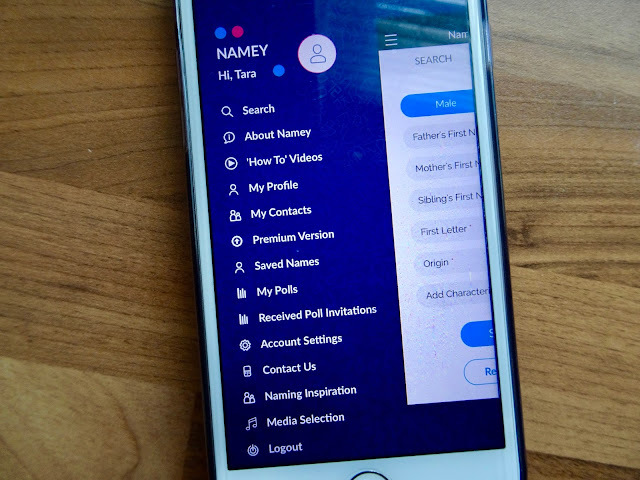 Simply enter your family names - which was great as it would suggest names that will go with your older children names, your desired origin, first letter of the name (if you had a preference) and the app will return to you its suggestions based on what you selected. This was really fun to do as at one point we wanted both boys to have a name starting with 'A' so it was interesting to see what the app suggested for us. Namey also can get family and friends involved as you can create polls of preferred boys and girls names to see what everyone liked the most, although ultimately it is up to you the parents at the end of the day but it can be nice to involve family members too. You can easily send these polls via WhatsApp, iMessage, email or even publish on Facebook / Twitter. You can have a lot of fun with this and get some good feedback at the same time as well. With the Namey Lite version you can have access to 9,500 names, and you can add up to 10 baby names to each poll - maximum of 3 polls can be shared. With the Namey premium version you have access to 25,000 names, can add up to 15 names to each poll - and share an unlimited amount of polls, its definitely worth getting the premium version if you're really stumped for a name like we was.